World Sleep Day With Jennifer Szohr — THE HANNA BLOG Worked like a charm! Put your #hannajams on, it’s World Sleep Day! 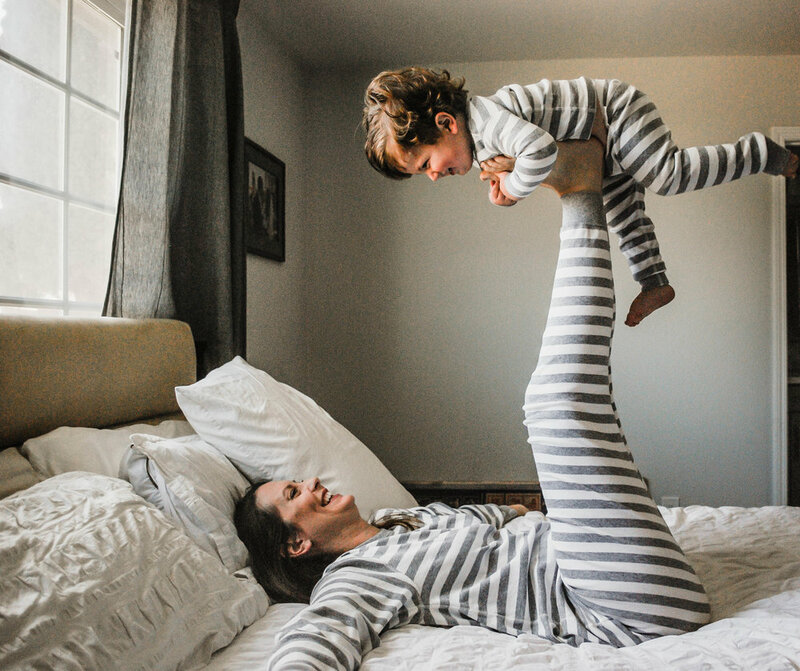 To celebrate we partnered with Sleep Consultant Jennifer Szohr to talk about sleep + host a hannajams giveaway. Jennifer is a mom of two, soon to be three and sleep guru! We had fun chatting with her and hearing more about the ins and outs of sleep in her household. Explain sleep in your household with one word. I don’t want to make people jealous but my kids sleep really well! My husband and I were just talking about this and we both said the word priority. We really do schedule our lives to make sure that sleep is a priority in our house. This means that nap times and bed times are on time every day. Why do you think sleep is important? This is always my favorite question. A healthy diet and healthy sleep are the two biological needs humans have that they can’t live without. For me, just like for infants, toddlers, and children, just like having a healthy diet, it’s the same with sleep. When we don’t get healthy sleep we’re not ourselves, we’re dragging at our jobs or short tempered as moms. You can tell when a toddler or a child has good sleep because they’re well rested and there’s less behavioral or emotional issues, except toddlers, they melt down all the same, sleep or no sleep. Do you miss your littles when they’re sleeping in their room? Yes! Just yesterday, our three-and-a-half-year-old had a really rough day and so I just went into her room and stared at her for a little while because I feel so connected to her I don’t want her to be alone sometimes at night. I’m one of those who needs a lot of sleep like 8-10 hours and I function better if I get at least that amount. I knew that about myself before I had kids so before I even had them, I read something like twelve sleep books because I needed to know what’s the quickest route to getting little humans to sleep! If you don’t get sleep, how many cups of coffee do you drink to feel normal? I never feel normal! If you don’t sleep or even if you sleep really well, motherhood and parenting in general is just so exhausting, you’re chronically exhausted for the rest of your life.! But to answer your question, currently I’m pregnant so I limit myself to a cup or two. What’s your bed time routine for your little ones? After dinner, we go outside and play in the neighborhood until bath time. We then come in, take baths and read a few books before the kids get into bed and that’s really it. Our son goes down at 630pm and our daughter goes down at 7pm. She’s a typical three-year-old though, she lays down and then she has to go to the bathroom or she’s starving, or thirsty and if we tell her no she’ll ask you’re going to let me go to bed hungry?! What bedtime books do your kids love? Our 16-month-old is very consistent, he picks up the same books before bed every night which is really cute. He loves the book called When you were small and all of the goodnight state books like goodnight Texas and Goodnight California. We usually always read three books before bed. Our daughter is really into the author who wrote Creepy carrots, so she always picks out his books. What’s your advice to new moms when it comes to sleep and/or bedtime routines? In the beginning, it’s a lot of feeding and trying to figure things out but the most important thing to me is consistency and sleep environment. Having your baby sleep in the same place, always in their crib or their basinet or rock n play, wherever you have them sleep, just making sure that they’re always in the same place for naps and bed time. Sleep environment is also so important. We always made sure that our littles slept in a dark room with a noise machine so that they were able to fall asleep unassisted. Do your kids sleep better after a full day of play? Vis-versa? Ya! When we get our kids outside to play and get their energy out they are much more tired and sleep better. When they were infants they were always tired and now in the toddler years, when they don’t get their energy out they wake during the night or are very restless. Don’t forget to enter to win a set of family matching #hannajams on Facebook or Instagram! This giveaway is in no way sponsored, administered or associated with Facebook or Instagram.